Viewing performances of TV prayer over a five-year period suggests that Roberts became increasingly aware of the capacities of the new televisual medium. This technical production of presence for the isolated members of the television audience interfaced techniques of prayer with the medium of television to “project” the Holy atmosphere of the tent into the privacy of the home. In the incipient stages of the TV prayer, Roberts encouraged the televisual audience to participate and “believe with me” as he prayed for their healing. Thousands of letters from members of the television audience claiming to be healed through this prayer inundated the Tulsa headquarters of the Roberts organization during the first year of telecasting. 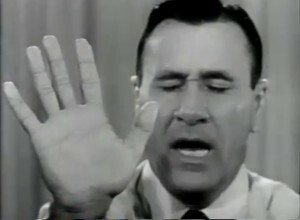 After many broadcasts of this early televisual curative technique, the performance of the prayer became more charismatic, with pronounced modulations of the voice and vigorous gesticulations directed right at the camera. This more enthusiastic performance was coupled with instructions for the television audience to place their hand upon their chest as a point of contact for the release of their faith. By 1959, the cinematic eye had drawn so close to the healing performance that the two techniques became intertwined or interfaced in the final manifestation of the TV prayer. Through a cinematic close-up, Roberts face almost fills the screen as he speaks directly to the camera: “This is your moment. This is God’s hour to heal you and make you whole. Please come up here and touch my hand, and let me touch your hand with my hand and let me pray for you….”. (at 22:50 in the video). During these ritual preparations for the healing prayer, Roberts raises his right hand of discernment and meticulously places it upon what seems to be a translucent pane of glass. Through this performance of cinematic trucage, the hand of the healer appears to be not only enlarged to disconcerting proportions, but the flesh itself is visibly displaced as it is pressed against a clear substance. This transparent glass surface not only mimics the cinematic eye, but foregrounds the doubled immediacy of the television screen itself as an experience that is simultaneously present and actual within the private space of the home yet subsists in a public or communal experience somewhere else. This cinematic special effect produced a sensation of sacred presence for the television audience, as if the hand of the healer himself was actually pressing against the screen. Many years later, this doubled immediacy of the televisual membrane would be utilized for specifically uncanny effects in popular films such as Steven Spielberg’s Poltergeist (1982), and David Cronenberg’s Videodrome (1983). Within the symbolic form of Holy Ghost power, this televisual doubling can be mobilized in the service of a curative rite; once freed from the realm of the sacred, the permeable surface of the screen becomes a harbinger of death and unbearable anxiety. The healing television prayer pioneered by Roberts in the middle of the twentieth century now continues on a global scale, with televangelists all over the world instructing their audience to make tactile contact with silhouette handprints upon the screen, or place objects upon the television set to be ingested or rubbed against the skin. Perhaps the most important clue to this technological history of prayer resides in that iconic image of prayer as two hands pressed together. In a televisual age, the two hands-at-prayer realize new tactile and experiential possibilities through the mediation of mechanical eyes, translucent screens, and special effects.